Hyperhidrosis is the name for a condition characterized for the excess of sweating, this condition is caused by a failure of the sympathetic nervous system producing more sweating than the amount required to equilibrate overall temperature. It mainly affects areas such as armpits, palms of hands, face and soles of the feet; this syndrome implies an intense alteration of the psychological state of the person and makes more difficult social interaction, for this reason many people affected by this syndrome see how their quality of life is affected and feel they are losing control over it since sweating can emerge independently from the temperature of the body or the mood of the person. This alteration can emerge on early stages of life like childhood or puberty and if a proper care is not provided by then for this condition, it can affect the individual for the rest of his or her life. It has been found that about three percent of the population is affected by this syndrome on the primary type and it affects in the same proportion to women and men. About forty percent of people affected by this condition have a family member affected by it too; therefore giving place to the conclusion that this disease can be genetically inherited. 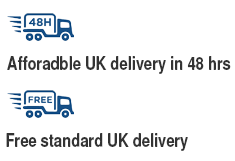 There can be distinguished two types of Hyperhidrosis: primary and secondary. Primary hyperhidrosis can begin at any stage of life and its background is nothing more but the excess of sweating, while the secondary hyperhidrosis can emerge because of the presence of disorders on the thyroid gland or the pituitary, diabetes mellitus, infections, menopause, tumors, and the intake of certain drugs. Although its cause has not been identified with precision yet, it is usually focused on the dermatologic perspective, it means that it is related to a hyperactivity of sympathetic fibbers and an increment on the peripheral sudomotor response. It has a trend of affecting more than one member of the same family and has an incidence on young people population of about 0.3%. The excessive sweating is caused by the over-activity of seating glands. It can be generalized as it can be confined to a specific area such as palms, armpits, inframammary regions and groin. The skin on affected areas can have a pinkish coloration or a white-bluish coloration. On the most severe manifestation it can cause the emergence of peeling, funguses, irritation, bad smell and skin pigmentation. The bromhidrosis is a process on which skin is affected by a bad smell caused by the decomposition of cellular waste and sweat caused by bacteria and yeast. The increment of hydration on skin can become a contributing factor for the emergence of a variety of skin diseases such as contact dermatitis and pyogenic or fungal infections. The generalized type of hyperhidrosis is usually accompanied by fever. And endocrine alteration, for instance hyperthyroidism, or in occasions a diseases of the Central Nervous System can also be a triggering for a generalized sweating. The cause for localized hyperhidrosis is also unknown; it usually affects totally normal individuals. 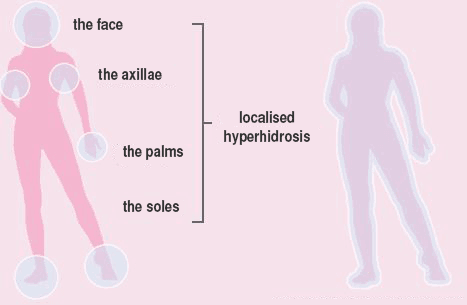 The hyperhidrosis has an important incidence over the quality of life of people that is affected by this syndrome. Although the person can coexist with the disease, it can cause emotional stress making more difficult the normal development of activities of the person on the occupational, personal and social stage producing the creation of a vicious circle since the need of feeling “dried” again (specially on men) and the preoccupation for having a bad smell (specially on women) produces more stress on the social environment therefore producing more and more sweating. In worse cases the excess of sweating can turn people reticent in matters of social relations avoiding situation when they have to get in contact with other persons, hyperhidrosis is a possible cause for social phobia. In that kind of cases it is advisable for the person to look for the assistance of a psychologist in order to see the best way to handle the situation which has become uncontrollable, the patient may the need to have relaxation therapies in order to handle in a better way the condition knowing that this is not a very important problem and which can be controlled through the application of behavioral systems. Hyperhidrosis can also become problematic at the time of developing usual activities, for instance it makes harder to manipulate papers, buttons, tools, pencils, electronic equipments or music instruments like piano. The diagnosis of hyperhidrosis is of the clinical type, the patient is conscious about the difference between him or her and the rest of the people observing a profuse sweating without an apparent reason which turns to be disproportionate compared with the parameters of normal sweating. The hyperhidrosis starts with an exaggerated increase of sweating that usually affects in a special way hands, armpits and feet. Apocrine glands: this type of glands have characteristics of the previous types of glands mentioned, these are located on armpits. The vegetative nervous system regulates the sudomotor activity through the cholinergic receptors located on sweating glands. The generalized sweating is activated in the presence of thermal stimulus and is regulated by orders coming from the hypothalamus. However there are sweating glands in other areas like palms, feet plants and armpits are especially sensitive to emotional stimulation. The problem is the psychosocial stress suffered by the person that is affected by hyperhidrosis. The special formulation of Driclor has as a main goal to relief the symptoms and manifestations associated to this condition. 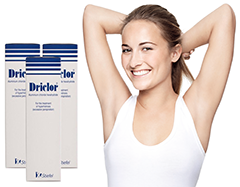 Driclor deodorant will work to significantly decrease to eventually stop sweating.